Peppa Pig is and her family are pretty darn cute. In this latest story Peppa and brother George are very excited about their first museum visit, even though they have no idea what to expect. Peppa's all excited about the King and Queen room - fancy jewels and pretty gowns. George is anxious to see the dinosaur room (even though he's a little nervous), because Mummy and Daddy are there to reassure him. They even get to see a space exhibit, a pretend space ship, and try what a moon walk might be like. There's even a snack bar which ranks high on dad's list of favorites for this outing. 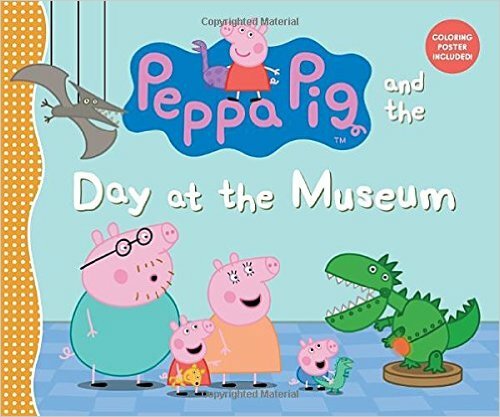 This is an adorable book that Peppa fans, as well as Peppa "newbies" will love. The colorful illustrations will be a hit with young children and, the dust jacket even includes a coloring poster on the inside. Peppa the Pig is very popular among my daughter's set. My daughter and I haven't read any of the books, however. This one sounds like fun.